Preheat the oven to 200°C. Place the oil in a large roasting tin and place in the oven to heat up. Cut each apple into about 8 wedges. 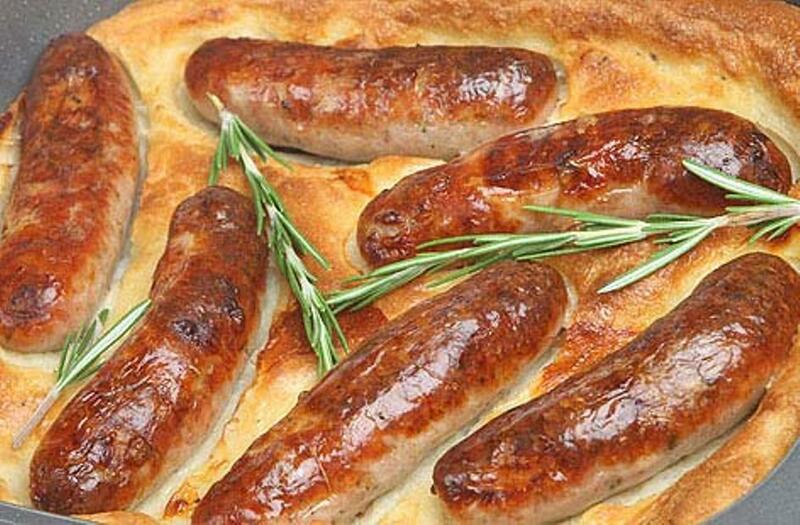 Remove the hot roasting tin from the oven and add the sausages, apple wedges and rosemary and roast for 10 mins or until beginning to brown. Whilst the sausages cook, place the flour in a bowl with the salt. Make a well in the centre and break in the eggs. Gradually whisk in the milk and water until the mixture is smooth. Set aside. Remove the roasting tin from the oven and shake well, pour over the batter then return to the oven and bake for 30-35 mins or until golden and risen. Serve with vegetables and gravy. This entry was posted on June 15, 2011 at 9:12 am and is filed under Food with tags apples, eggs, plain flour, pork & leek sausages, recipe, rosemary, salt, semi-skimmed milk, toad in the hole, vegetable oil. You can follow any responses to this entry through the RSS 2.0 feed. You can leave a response, or trackback from your own site.